The beach chalet sits a 2 minute walk to a picturesque secluded swimming and surf beach with tennis courts and kids play area on the grassy bank along the beach. Excellent mountain biking trails. Access to swimming pool and hot tub 5 minute walk away. Kayaks and BBQ available for hire. Lovely large outdoor deck with new furniture. Fully equipped kitchen. 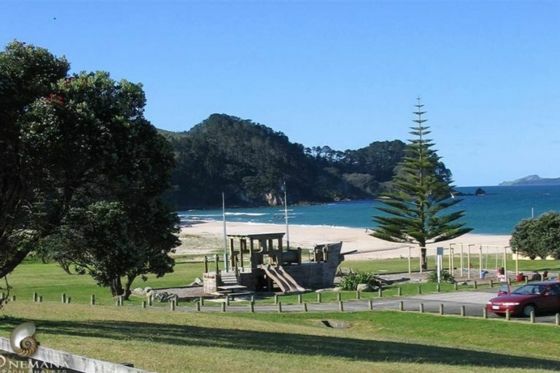 Popular surfing town Whangamata is a 10 minute drive away with fantastic cafes, restaurants and shops. Equipped with electric blankets and heaters it's proven a popular chalet for winter stays too! Onemana is known be a great surf beach and on calm days, a great family swimming and kayaking spot. Across the beach road is a local dairy shop and cafe for coffees, ice creams or dining. Behind the cafe is a beautiful lake lily pond with ducks to feed. The beach itself is uncrowded so a peaceful walk along the shore is guaranteed. Kayaks can also be hired. From Onemana there are a number of amazing, scenic bush walks leading to private swimming beaches and perfect picnic spots. If you like to mountain bike, there are fantastic trails all around Onemana's green belt. Whangamata surf township is 10 minute drive away with many restaurants and cafes to choose from and two more amazing beaches. Low tide you can walk to a desert island! There is also boat launching facilities there. For a Coromandel day trip, it's only a 45 minute drive to famous Hot Water Beach (dig your own hot water pool in the sand) and then pop up to Hahei - take the one hour coastal walk to descend into Cathedral Cove - famous for stunning views (a photographer's dream) and clear water beach to cool of with a swim. For golfers there are two courses in the area or 30 minute drive to Pauanui Pines Golf Club which is fantastic and only $25 for 18 holes. Clubs can be hired and you'll need to book a tee time in summer months. Fishing charters are easily arranged for a bespoke adventure on the beautiful waters - details provided in request. Linen provided but please bring your own beach towels. Check in and check out times are flexible but in high season check in is 3pm and checkout is 11am. But please check with the onsite manager Anne before you arrive - if it's not busy we can be flexible :) Her number will be provided when you book. Grass beachfront with tennis court and kids play area. Rackets/balls/petanque available for guests. Parking in carport right outside chalet. Fully equipped kitchen with pots, pans, plates, cups etc. Table for dining inside and outdoor dining table on the deck. NZ Monopoly and other games available. Membership allows guests to use the spa and pool complex just a short 5 minute walk down the road. The pool is solar heated so best for summer months! The spa and pool complex has 4 spa pools in individual rooms. Great spot, not far from the beach. Chalet was clean and tidy and owner was very helpful . Loved the simple bach feel. Tidy, uncluttered and clean (much appreciated), every kitchen item was newish and clean (greatly appreciated), oven needed a clean, beds and bach are getting older and may need some maintenance. The space suited us really well and we would come back. Absolutely loved going back to Onemana, unit 7 was beautiful and would love to get the same unit again. The unit was so well equipped with beautiful linen and electric blankets on the beds. There was also 2 heaters that wasnot on the listed chattels on the internet, and this was one of the questions I had emailed Kathryn about, also no checkin and checkout times advertised I telephoned Anne and she was so helpful. So appreciated Annes generocity, can't wait to go back. Very neat and tidy! beds on the mezzanine gave the space a bit of character.